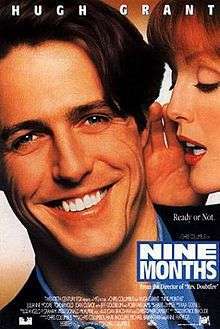 Nine Months is a 1995 romantic comedy film directed by Chris Columbus. It stars Hugh Grant, Julianne Moore, Tom Arnold, Joan Cusack, Jeff Goldblum, and Robin Williams. The movie is a US remake of the French movie Neuf mois and served as Grant's first US starring role. It was filmed on location in the San Francisco Bay Area. The original music score was composed by Hans Zimmer. Child psychologist Samuel Faulkner has an ideal romance with ballet teacher Rebecca Taylor. Rebecca is thinking about marriage and children. Samuel is against the idea of marriage as he is happy with how things are between them. This all changes when Rebecca declares she is pregnant and when questioned by Samuel about her birth control she replies birth control is only 97% of the time effective. Samuel's fears mount due to his encounters with overbearing couple Marty and Gail Dwyer and their unruly children, as well as the confusing advice he gets from Sean, his perpetually single artist friend. They meet Doctor Kosevich who happens to be Russian. Samuel is confused and unsure about what to do. Feeling neglected, Rebecca leaves him and moves in with Marty and Gail. Samuel tries to contact her but she does not respond. When a girl makes a move on Samuel, he declines, saying he's not ready to move on yet. When he sees an ultrasound of his soon-to-be-born son, he decides that it is time to take responsibility before it is too late. He sells his Porsche 911, buys a family van, and gets back together with Rebecca. They then marry and have their baby together. The film was poorly received by critics. Rotten Tomatoes gives the film a score of 27% based on 26 reviews. Roger Ebert gave the film two stars, saying, "Nine Months is one of those movies where the outcome is abundantly clear to everyone but the hero, who remains in the hapless position of playing dumb because, if he didn't, there wouldn't be a plot." The movie debuted at #3 at the box office behind Apollo 13 and Under Siege 2: Dark Territory with $12.5 million in its opening weekend. Nine Months went on to gross $138.5 million worldwide. ↑ "Nine Months". Box Office Mojo. Retrieved 2010-09-29. ↑ "Nine Months". Rotten Tomatoes. Retrieved 9 August 2014. ↑ Ebert, Roger (1995-07-12). "Review: Nine Months". Chicago Sun-Times. Retrieved 2010-11-11. ↑ Dutka, Elaine (1995-07-18). "Weekend Box Office : 'Under Siege' Opens in No. 2 Spot". Los Angeles Times. Retrieved 2011-01-13.